New York City officials agreed on Tuesday to a plan that would eliminate the use of solitary confinement for all inmates age 21 and under, a move that would place Rikers Island at the forefront of national jail reform efforts. The policy change, which was approved unanimously, 7 to 0, by the city’s Board of Correction on Tuesday morning and is supported by the correction commissioner, Joseph Ponte, would not take effect until January 2016 and is contingent on obtaining financing for additional officers and clinical staff members. The Correction Department has been criticized over the last year in light of revelations of horrific brutality and neglect of inmates. The United States attorney’s office in Manhattan is now suing the city over its treatment of adolescent inmates. In the face of mounting scrutiny, the city has provided millions of dollars for better staffing and improved programs for inmates. It also recently eliminated the use of solitary confinement for 16- and 17-year-olds. Until Tuesday, the administration of Mayor Bill de Blasio, backed by the powerful correction officers’ union, had strongly resisted any efforts to curtail solitary confinement more broadly. Even the most innovative adult jails in the country punish disruptive inmates over the age of 18 with solitary confinement, said Christine Herrman, director of the Segregation Reduction Project at the Vera Institute of Justice. "I’ve never heard of anything like that happening anywhere else," Ms. Herrman said, referring to the New York City plan. "It would definitely be an innovation." There is a large body of scientific research indicating that solitary confinement is particularly damaging to adolescents and young adults because their brains are still developing. Prolonged isolation in solitary cells can worsen mental illness and in some cases bring it on, the studies have shown. Inmates in solitary confinement at Rikers are locked in their cells for 23 hours a day with one hour of recreation, shackled by themselves in an enclosed chain-link cage. A report published in August by the United States attorney in Manhattan, Preet Bharara, described the use of solitary for young people at Rikers as "excessive and inappropriate." Inmates can be locked away for weeks and months and in some cases over a year. As of Jan. 9, according to recently released city data, there were 497 inmates between the ages of 19 and 21 at Rikers, with 103 of them held in solitary confinement. Jail reform advocates who have criticized the Correction Department for years praised the initiative. The New York Civil Liberties Union said the changes would "make Rikers a leader in solitary confinement reform." "With these reforms, New York City has taken an important stand for basic human rights and reaffirmed its commitment to the safety of prisoners, prison staff and our communities," said Donna Lieberman, the organization’s director. "An institution as profoundly broken as Rikers Island will require wholesale reform to transform into a humane environment that emphasizes treatment and rehabilitation over punishment and isolation, and these rules are a major step forward." Norman Seabrook, the president of the 9,000-member correction officers’ union, said the plan, which appeared to take him by surprise, would endanger correction officers. He vowed to sue the board for every guard assaulted. 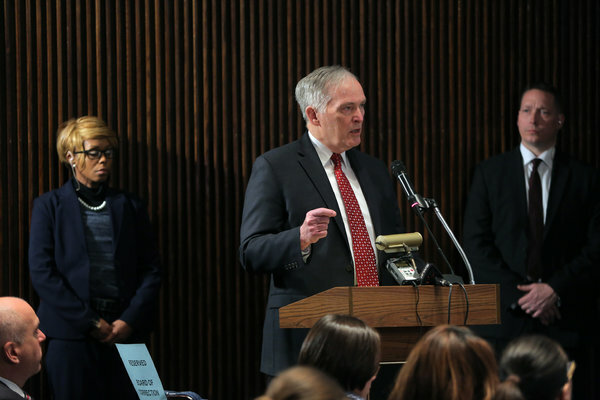 "I’m deeply, deeply bothered by a decision that you would make, jeopardizing the safety and security of inmates and officers," he said, addressing the board on Tuesday. After years of battling between inmate advocates and city officials over solitary confinement, the agreement Tuesday appears to have been worked out between Mr. Ponte and Bryanne Hamill, one of the board’s strongest voices for eliminating the use of solitary for young inmates. The two met Monday morning at the behest of Mr. Ponte and spent 45 minutes working out the details of the initiative. Speaking to reporters after Tuesday’s meeting, Mr. Ponte said he was confident he would be able to get the necessary resources from the city to put the plan in place next year. Ultimately, he said, getting young inmates out of solitary confinement will drive down violence. "The idea we lock people up for any length of time and don’t provide them with programs or treatments" does not lead to good outcomes, Mr. Ponte said. "It seems to defy logic."